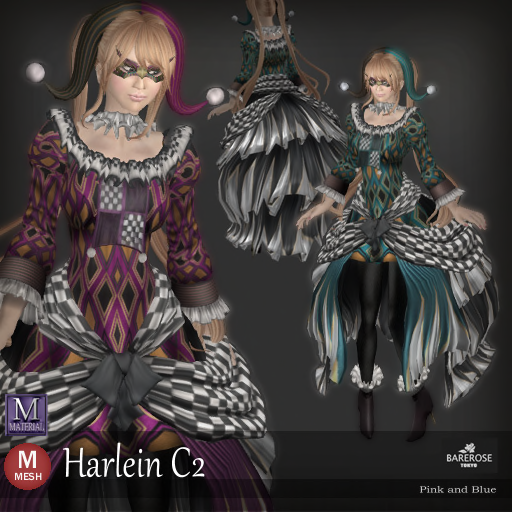 The Harlein C2 comes in 2 colors - Pink and Blue. What you are seeing now is the Blue version which is bright and checkered with black and white, it is a perfect outfit for the mysterious party. And here is a close up of the friendly Harlein Blue. It is bound to cheer anybody up and that is exactly what a jester would do. Well, even the little reindeer is crowding around Kitty because she has a good aura of happiness wearing the Harlein C2 from Bare Rose. As a stand up dress, the Harlein C2 is deep in details and the texture is very stunning not only because it is mesh, but it is material enabled as well. See how elegant and detail the whole outfit is from head to toe. Even the eye mask and jester cap is of high detail quality. If the Pink is what you are looking forward to, then here it is in the same package at no extra cost. There are 5 pieces of the outfit that can be changed for the Blue / Pink combinations. Well the Pink is definitely cute, but if you prefer, you can always mix some Blue with Pink and maybe that might even level up your jester effect! Being a good fitted outfit with alpha, it allows you to go into any position without much issues with broken prims and overlapping. See how easily it looks just right and nice even when Kitty is standing, sitting or just leaning onto the rocks. Don't you want to look as good as Kitty now?